Start the journey on the road to recovery with Innovation360 Dallas. If traveling eastbound on 635, take the Hillcrest exit. Turn right on Hillcrest Plaza Dr., the last road before the Hillcrest intersection and stoplight. If traveling westbound on 635, take Hillcrest exit. Take a left on Hillcrest, and then a right on Hillcrest Plaza Dr. Our building will be the last one on the left, closest to the 635 frontage road. If traveling on 75 southbound, take the Frontage Road exit just before 635. Turn right on the 635 frontage road. Take a left on Hillcrest, and then a right on Hillcrest Plaza Dr. Our building will be the last one on the left. If traveling on 75 northbound, take the Coit exit, turn left on the 635 frontage road. 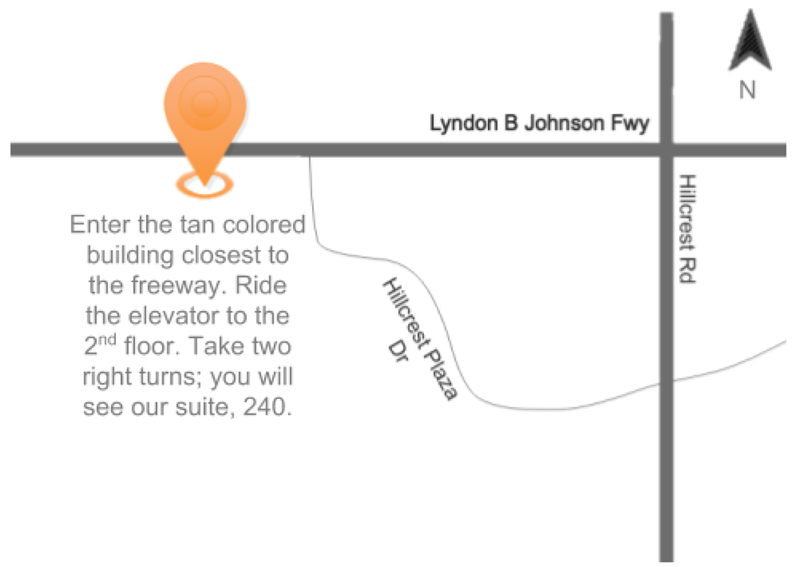 Take a left on Hillcrest, and then a right on Hillcrest Plaza Dr. Our building will be the last one on the left.